China (Traditional Chinese: 中國; Simplified Chinese: 中国; Hanyu Pinyin: Zhōngguó (help·info); Tongyong Pinyin: Jhongguó) is a cultural region, ancient civilization, and nation in East Asia. It is one of the world's oldest civilizations, consisting of states and cultures dating back more than six millennia. The stalemate of the last Chinese Civil War has resulted in two political entities using the name China: the People's Republic of China (PRC), administering mainland China, Hong Kong, and Macau; and the Republic of China (ROC), administering Taiwan and its surrounding islands. See Political status of Taiwan. China is one of the world's oldest continuous civilizations. It has the world's longest continuously used written language system, and is said to be the source of some of the world's great inventions, including the 'Four Great Inventions of ancient China': paper, the compass, gunpowder, and printing. China is called Zhongguo in Mandarin Chinese. The first character zhōng (中) means "middle" or "central," while guó (国 or 國) means "country" or "state". The term can be literally translated as "Middle Kingdom" or "Central Kingdom." 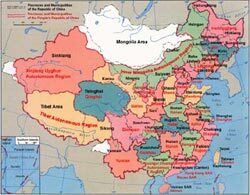 In ancient times the term referred to the "Central States" along the Yellow River valley. 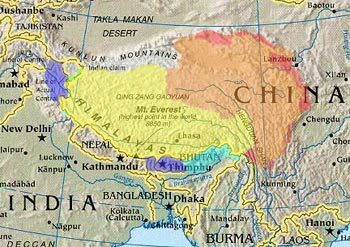 Tibet (older spelling Thibet; Tibetan: བོད་; Wylie: Bod; Lhasa dialect IPA: [pʰø̀ʔ]; Simplified and Traditional Chinese: 西藏, Hanyu Pinyin: Xīzàng; also referred to as 藏区 (Simplified Chinese), 藏區 (Traditional Chinese), Zàngqū (Hanyu Pinyin), see Name section below) is a plateau region in Central Asia and the indigenous home to the Tibetan people. With an average elevation of 4,900 metres (16,000 ft), it is the highest region on Earth and is commonly referred to as the "Roof of the World". For more details information with many different itinerary for your tour, treks, mountain climbing and any Adventure & Leisure Activities for China & Tibet please visit bellow link and if you are looking different itinerary please write us.